Have you ever ordered at a restaurant in a foreign country only to get an ugly look from the waiter? Have you ever asked somebody to do you a favor, only then to have them refuse with an upset tone in their voice? Well, maybe your problem when speaking English comes down to a lack of politeness. The English language is full of these little formalities which can definitely determine whether you’re going to make a good first impression on someone or not. We have this unspoken etiquette when asking for information, or even when we’re offering something and we have to take into consideration how we are offering it. Using please and thank you is necessary in most situations. In a lot of situations, people expect a sort of indirect way of speaking to each other, which in my opinion is a little silly. But hey, when in Rome do as the Romans do (follow the cultural rules wherever you are). Can I/Could I – Could I have a coxina please? Can I have a coke please? Could I order please? Can you lend me ten dollars? May I (used in more formal situations) – May I attend the meeting next week? May I join you for lunch? Do you mind if I listen to my funk music really loudly / Would it be a problem if I listened to my funk music really loudly / I was wondering if I could listen to my funk music. These three expressions can be used in any situation when asking for permission. When asking this way we also have to use a softer tone of voice. The reason we do this is because we want the person to know that if it’s going to irritate them, they have the option of saying no without feeling uncomfortable. Sounds crazy right? We’re so worried about offending the other person. That’s English for you. In English, when we don’t understand what someone says, the first reaction would be to say “sorry?” (in a soft tone of voice). Not “sorry” like “desculpa” but sorry like “oi?” This is the most common way, and it is considered to be polite. In Portuguese, you guys use a different method: “UHHHHH?” Now that I have been living here for a while, I know that you are not being rude when you say this, but from a foreign perspective, especially when you’re not familiar with the language, this can be kind of troubling. My first impression when someone said this to me was “Damn, I’ve just offended this person in some way” or “My Portuguese is so bad that he or she is getting angry.” So try avoiding this one in English. Sorry? – It’s polite and they will repeat, maybe even simplify what they just said. Pardon (me)? – A more polite way of saying sorry. This is sometimes used in a a more formal situation. Excuse me? – This is asking the person to repeat. Depending on the tone of your voice, it could express shock at what the person said, or maybe that you didn’t like the context of what they said. Last but not least, the awkwardness of having to say no to people. When travelling, or spending time in an English speaking country, we are always going to come across these situations. Ladies (Or guy for that matter), have you ever had to turn a guy down but didn’t want to offend him? Or maybe you have had to disagree with someone, but you didn’t want to be sound defensive. In English, we use these softening tools to make what we say not so so direct. Sounding polite is obviously a personal choice everyone has to make on their own. There are some situations where we have to put our foot down, be demanding, and even rudeness could sometimes necessary from time to time. So, my advice to you all would be to always try to use these polite expressions when in a foreign country, as you can never be too sure what is considered rude or polite in their culture. If you liked this article, you’re always welcome in the Real Life English facebook page and feel free to “like,” comment and/or share with your friends. Subscribe to our mailing list to receive our free monthly Real Life English newsletter, with exclusive language learning tips, updates, invites to events, and access to our vast database of articles. And finally, we would really appreciate it if you spread the word about the project. Thanks for your support! If you really want to communicate well in English, remember to check out this article. Very good. I am learning English and this site has been very helpful. About listening to Funk in the bus, the brazilians could act the same way that australians 🙂 . Hi Marcus, thanks for reading. Yeah I think if the Funkeiros were to be a little more polite their music would be tolerated more haha. But I’m not complaining, I enjoy Funk music when the time is right. Hi Chad, I really enjoyed reading! I could not agree more with Marcus about listening to Funk… I have a neighbor who listens to Funk so loud in his car that when he arrives at home, my windows tremble, I cannot hear the TV, and if I need to talk, I prefer to wait until he enters his home and turns the sound off. I need a polite words for my future as a homework…. 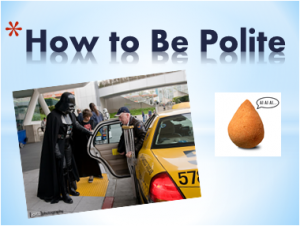 I'll try to be more polite in the future.Good and useful article! Useful article…thank you so much! I think these examples are very helpful. I love teaching my students the intercultural differences between the German and the English language, because I believe you cannot learn a language properly without understanding how native speakers are.